This essential guide to woodworking's most versatile tool includes a thorough analysis on everything needed to know in order to purchase setup use and maintain a band saw. 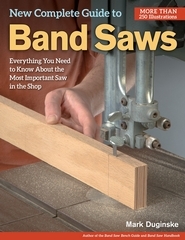 This book details what woodworkers need to know before purchasing a sawincluding the eight questions to ask before buying a used sawalong with topics such as a part-by-part overview of every component of the saw techniques of set-up and alignment choosing the right blade and understanding hand positioning to provide any woodworker with the most complete guide to a band saw. Special sections are devoted to band saw accessories how to deal with common problems and how to maintain a band saw to keep it running effectively and efficiently for years.